Ambition College was established in 2068 B.S. with a motive to aid in higher secondary, bachelor and master level. College has been successfully run in each and every streams by effective management. 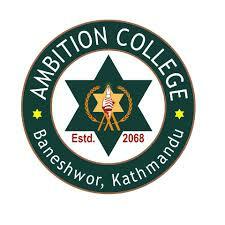 Ambition College is affiliated to Higher Secondary Education Board (HSEB) for higher secondary level and Tribhuvan University (TU) for bachelor and master level. It is located at Mid Baneshwor, Kathmandu, Nepal. Faculty members are experienced, dedicated, talented and motivated towards their work. Their effective teaching style and experience helps students to gain more knowledge. Staff members are probably one of the best in their streams around the valley. Besides +2 level in Science, Management and Humanities, this college also provides A level programs, Bachelor programs in BSc. CSIT, BBS and masters program in MBS. If you are interested in the field of Information Technology and Computing, then B.Sc.CSIT in Ambition College will be the right choice for you. As it a 4yrs program, students will able to be involved in-depth knowledge of theory, design, programming and application of computers. Browse the link for more information. BBS degree in Ambition College aims the students to achieve the wide range of knowledge and develop the ability to build up real-life business expertise. For more information and details on admission procedure, qualification, scope, and infrastructure, Click the Link. Scholarship schemes starts from minimum of first division for plus two level. Board topper, district topper and entrance topper are provided with full scholarships. Students getting top three ranks in each of their year or semester are provided too. Needy students are selected and approved for scholarship by college administration. As Ambition College has many streams of students from higher level to masters, facilities are provided of highest quality. Library with reference and text books are available. Daily magazines and journals are also made available to keep students up to date. Computer labs have sufficient numbers of computers and they are configured with latest software. Science lab each for physics, biology and chemistry. Sports area for playing basketball, football, table tennis, cricket and badminton. Transportation facility and college canteen is available too. Regular assignments, internal assessments and presentations are conducted to improve personal skills. Guest lecturers from specialist of different fields are called to take a presentation class. Seminars, college events, tours and competitions are conducted to provide extra knowledge apart from regular courses. Extra- curricular activities motivates student in gaining more knowledge and makes study process interesting. Ambition College provides peaceful and friendly environment. Plus Two Science: Candidates are eligible for plus two science with minimum of 60 percent and minimum of 50 percent for management and humanities. A level: A Level also requires first division marks for science and second division marks for non-science. An entrance test is taken by college and students must pass the test. Bachelors Degree: Bachelor level requires at least 45 percent from plus two or equivalent level. Science streams are eligible for studying Bsc.CSIT. CSIT students should pass the entrance test conducted by TU and college. BBS: Any streams are eligible for applying in BBS program. However, students should pass college entrance test. MBS: At least second division in required for applying in the MBS program. Master level also requires passing entrance test for application.